Raleigh, N.C. — Owners of plug-in electric vehicles can use one of Raleigh’s public chargers to bring their battery life from zero to 100 percent battery in about four hours. But new technology at North Carolina State University can cut that time to just one hour. Ewan Pritchard, a professor with the Department of Electrical and Computer Engineering, used a plug-in Nissan Leaf on Friday to demonstrate the fast charger on Centennial Campus. 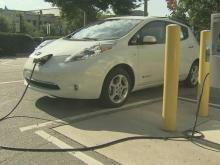 “This is the first fast-charging station on the East Coast,” he said. A full battery would give the car a range of about 90 miles. When he starts charging, the battery is at 72 percent. Within a couple of minutes, it’s at 78 percent. About 20 minutes after plugging in, the Leaf’s battery was charged and ready to go.